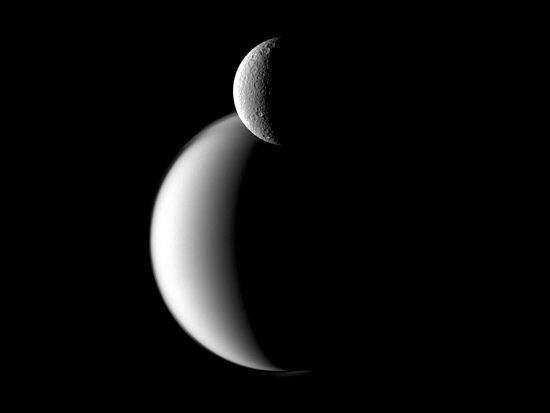 Rhea eclipsing Titan. 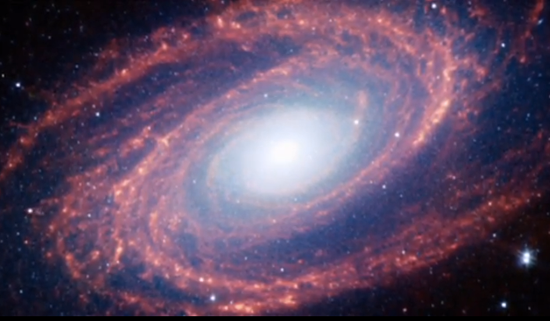 Credit: NASA/JPL/Space Science Institute. Recently, Cassini completed its multi-year mission in orbit around Saturn. 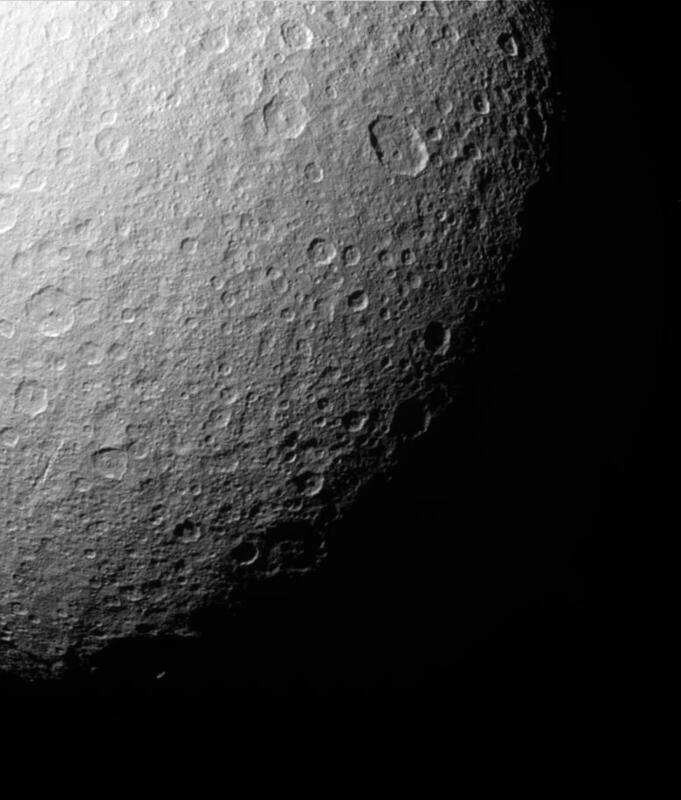 During that time, it trained its camera on the majority of Saturn’s moons, including Rhea. 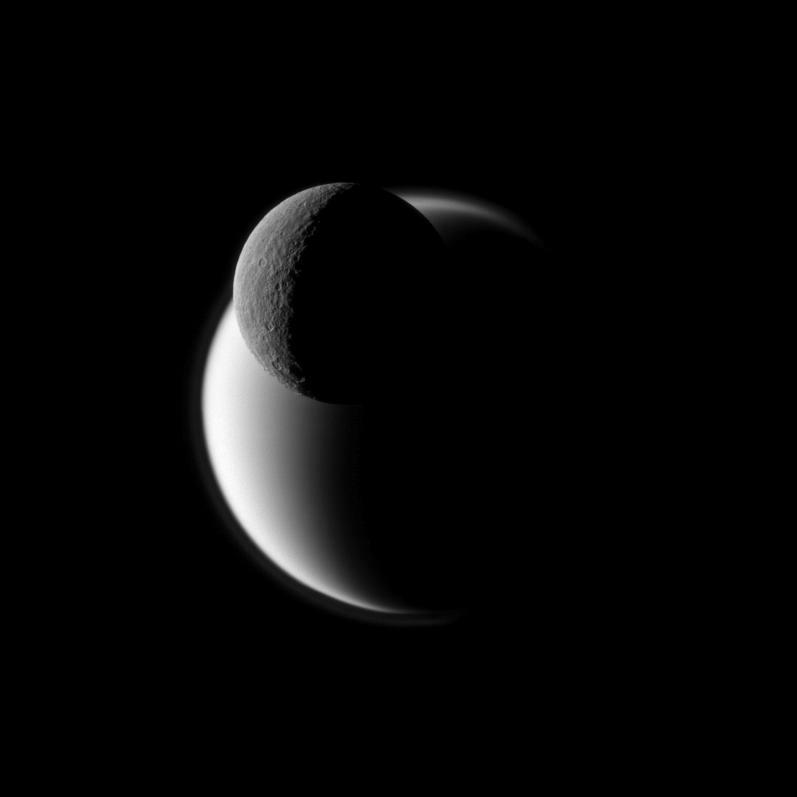 Rhea is second in size to Titan, with a mean diameter of 1528 kilometers. One of its more interesting features is that its entire surface is covered with craters, making it one of the most heavily cratered moons in the Solar System. 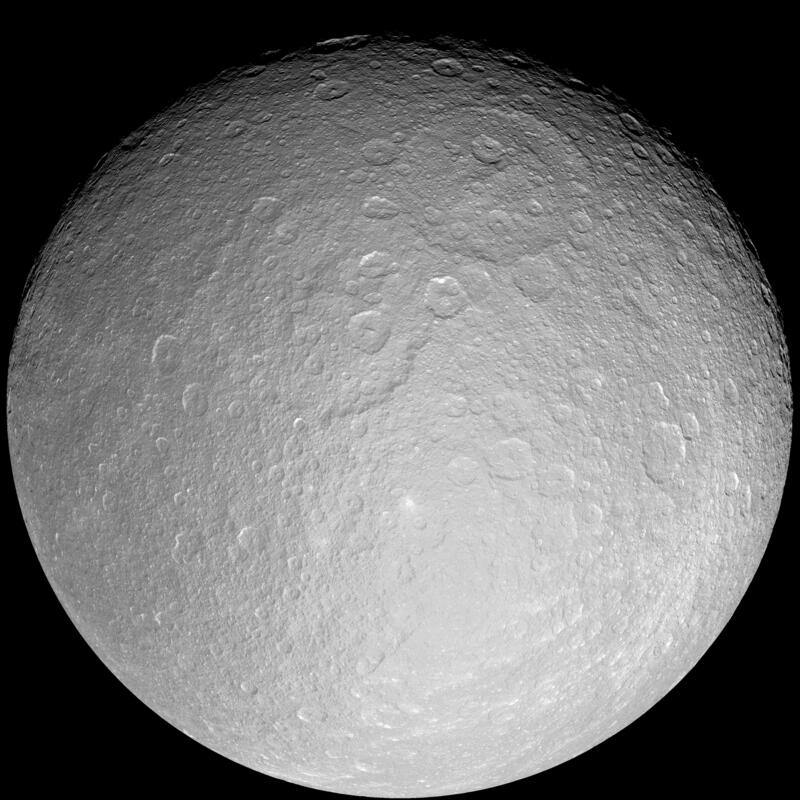 A bright rayed structure covers almost an entire hemisphere of Rhea, similar to those found on Earth’s Moon or on Mercury. 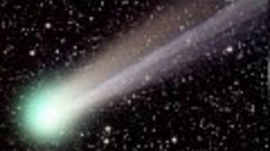 Astronomers think that some kind of impact hurled subsurface debris outward in long ejecta blankets. However, previous Picture of the Day articles note that rayed formations are more likely to be the result of electric arcs. For example, an examination of bright surface rays around Kuiper crater on Mercury reveals smaller craters mixed-in with the shallow streamers. 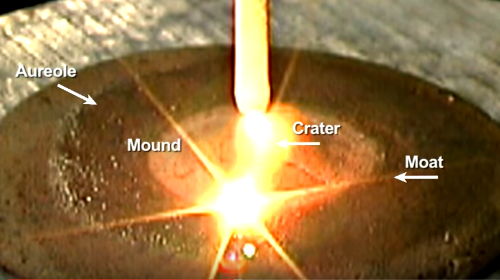 Many of the rays terminate in small craters. Tiny craters around Tycho crater on Earth’s Moon are also said to be “secondary impacts” formed from larger chunks of regolith in the dusty debris thrown-out from the initial impact. Mercury, like Rhea, has no atmosphere and no magnetic field to shield it from the Sun, so it seems reasonable to describe it using terminology applied to the Moon. 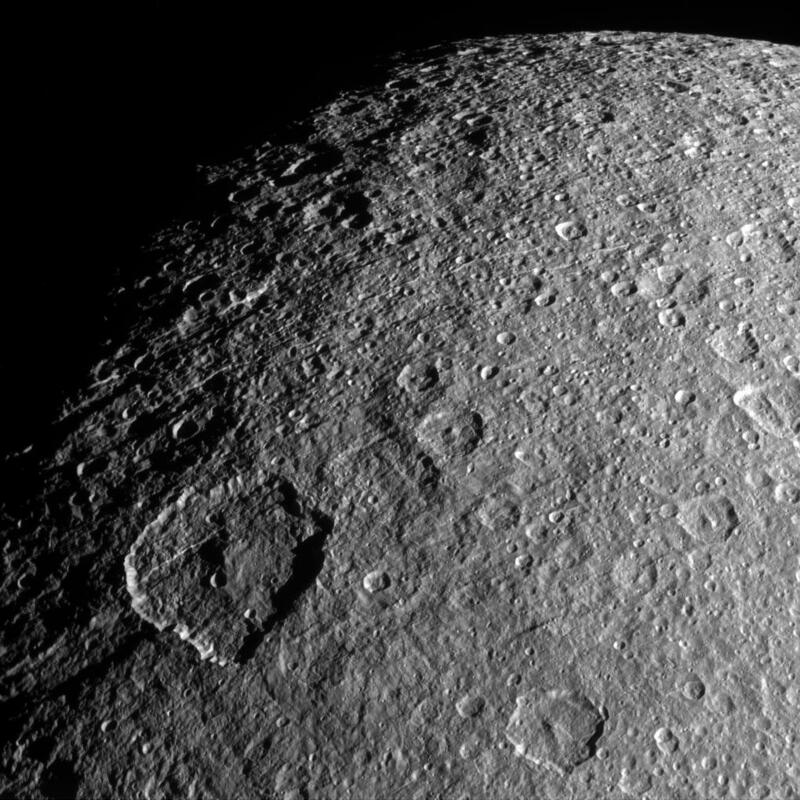 If the craters and rays so prominent there can be explained by electrical activity, then Mercury’s features, along with those on Rhea, might also benefit from an electrical hypothesis. Juergens thought that Tycho was where a plasma discharge struck the Moon. The hard radar-reflective floor of Tycho indicates that kinetic forces from mechanical impact are not a good theory for its formation. 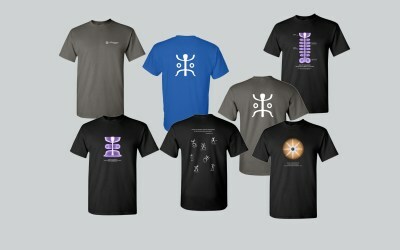 Tycho’s rays are the paths that electrons formed when the secondary discharge erupted into space, completing a circuit with the lighting leader stroke. Based on the concept, rays around craters are not ejected material, but are caused by charged particles rushing toward the center, dragging dust along with them. 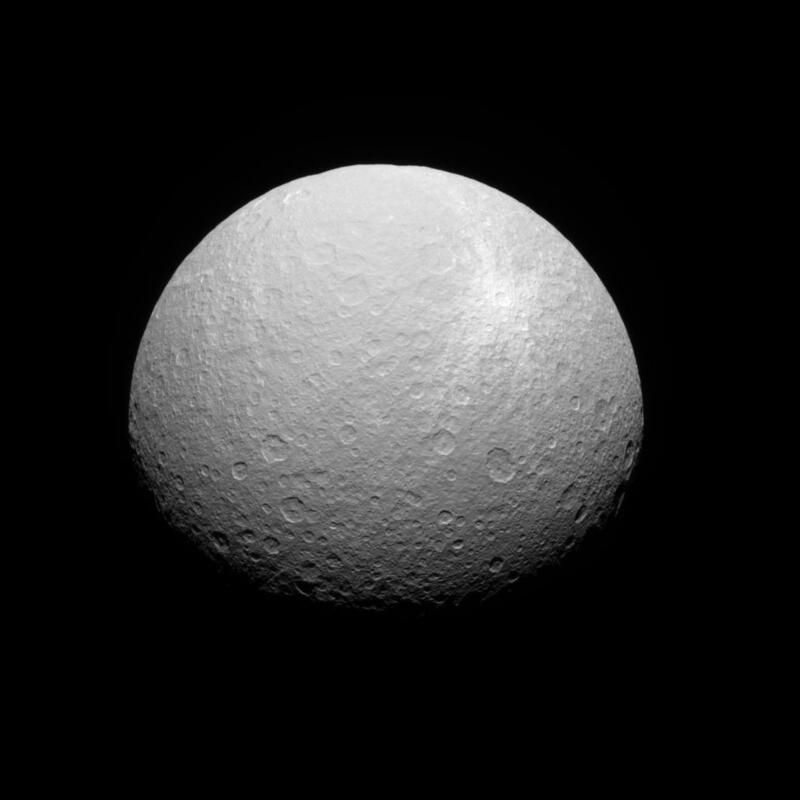 Getting back to Rhea, around one of its large craters, the rays are not deep, but instead appear to be a thin layer of dust. 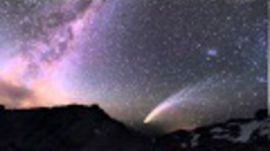 They were probably deposited by an “ionic wind” as plasma arcs reduced the surface rocks to fine powder, and then blew them away as ionized particles. 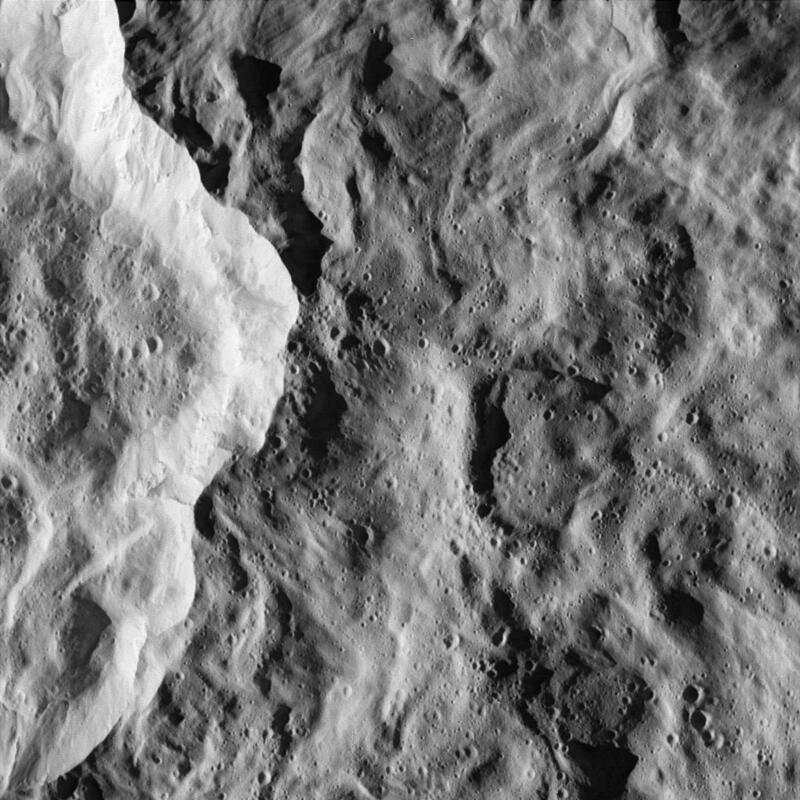 Nearly all craters on Rhea occur in multiples, the majority of the larger ones are in pairs with many smaller craters distributed around them non-randomly; they are found on the rims of the large craters, corresponding to what happens in electric discharge machining (EDM) when a spark will “stick” to one spot for a split second, carving small craters as the main discharge rotates within the large one. The impact of a space rock could never create such formations. 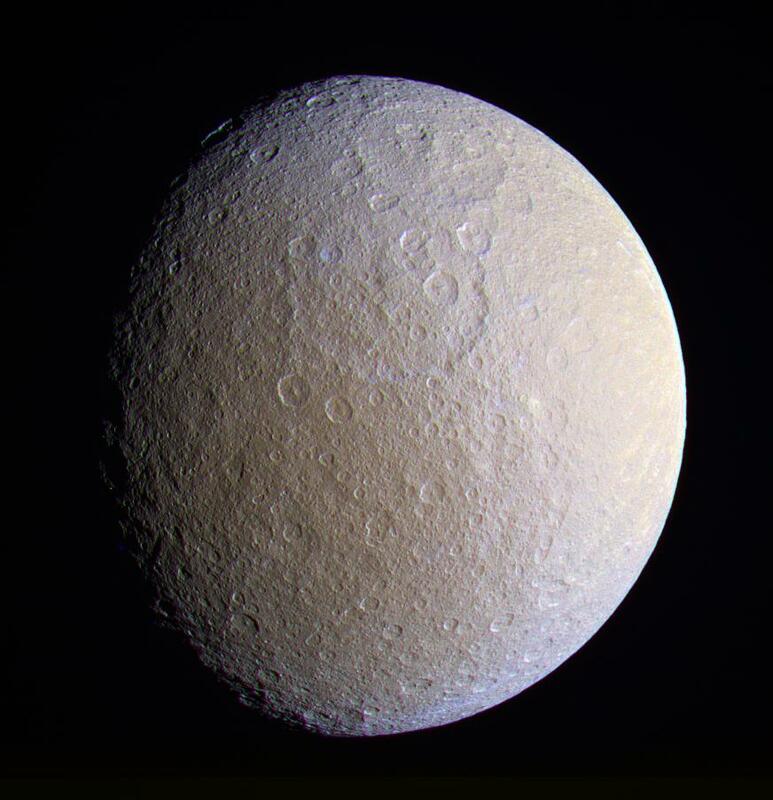 Another eye-catching feature on Rhea is an oval-shaped crater approximately 115 kilometers on its long axis. The conventional explanation is that it was formed when a meteor struck the moon and scooped out the crater along its direction of travel. Where is the gouge that should be at the bottom? 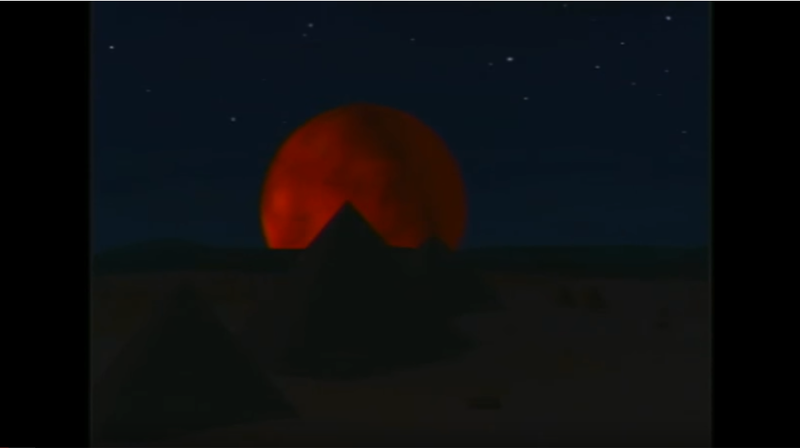 Why is the leading rim not built up from the movement of rock and ice as the meteor exploded through it at a shallow angle? 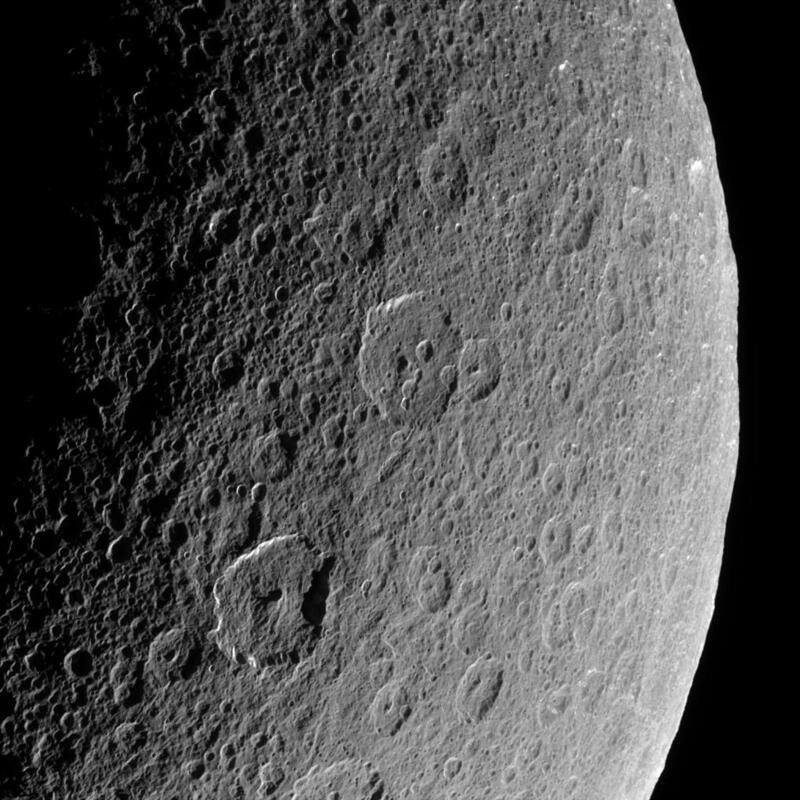 And why is the crater – and all the craters surrounding it – flat on the bottom with sharp, perpendicular walls? These are only a few out of many such huge structures that indicate Rhea did not undergo a slow, steady formation out of a nebular cloud. What was left behind is the record of those conditions in the form of fractures, chaotic terrain and gigantic caldera as big as Colorado, but with no debris. The Hundred Years War The Fires of Tamatea and 1348 AD.